NOCQUA Adventure Gear, the brand that revolutionized paddle sports and introduced a new category of night paddling to watersports enthusiasts is once again revolutionizing the category – and making it more accessible – with the introduction of NOCQUA Sport underwater LED lighting systems! NOCQUA Adventure Gear is the developer of the NOCQUA 2000 and NOCQUA Spectrum LED lighting systems, the world’s first and only high-performance, removable, rechargeable underwater LED lighting system for stand-up paddleboards, kayaks, canoes and more. Since the introduction of the NOCQUA 2000 in 2013, paddling enthusiasts, tour operators, fisherman and adventurists around the world have been enjoying and sharing a whole new way to experience their favorite past time. Now, NOCQUA Adventure Gear is now opening up the world of paddle sports – and night paddling – for all water sports enthusiasts, offering yet another superior underwater LED lighting system at an even more affordable price point with the introduction of the NOCQUA Sport. Following the same durable design and employing the same materials as the professional grade 2000 and Spectrum, the NOCQUA Sport delivers a full NOCQUA night paddling experience in a compact system. Specifically designed for adventurers who are ready to get out on the water past sunset and explore like never before, the NOCQUA Sport underwater LED lighting system produces 1,200 lumens of light to expose to users the world that lives underneath the water. 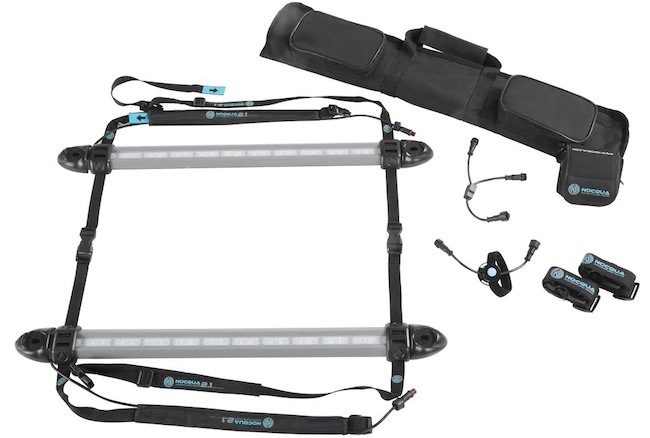 Each system comes with two waterproof LED lighting tracks; an adjustable harness; a 12V lithium ion rechargeable battery pack and charger; an in-line switch; a “Y” connecter to power both light bars with one battery; and two extension straps to ensure flexibility in use. Each battery is capable of producing more than three hours of light, allowing users to extend their time on the water well after sunset. Whether exploring unchartered territory or lighting up the night to bring home the catch of the day, no matter the adventure, NOCQUA Sport is the new, one-of-a-kind way to see and be seen in one of the fastest-growing outdoor categories among consumers. Paddling excursions are one of the most popular outdoor activities in the world today. In 2013, more than 17 million people participated in some type of paddling activity, with SUP and kayak fishing leading the way with a more than 30 percent growth in new participants. The NOCQUA Sport underwater LED lighting system will be available in March 2015. The NOCQUA Sport underwater LED lighting system will be available online and at retailers across the country beginning in March 2015 with an MSRP of $199.99. The NOCQUA 2000 and NOCQUA Spectrum, now known as the NOCQUA Pro Series, are available now at $349.99 and $399.99 respectively. For more information, please visit www.nocqua.com. Headquartered in Winston-Salem, N.C., NOCQUA Adventure Gear was founded in early 2013 with a mission to make outdoor enjoyment accessible for everyone. NOCQUA Adventure Gear’s products are designed for multi-sport athletes and engineered specifically for watersports enthusiasts. The NOCQUA Adventure Gear team hopes customers will use their products as a means to connect with the environment around them and create new, shared experiences with family and friends. For more information, please visit www.nocqua.com.